The Edmonton Valley Zoo is open 364 days of the year. An annual pass is a great investment, allowing your family to see the animals any day of the year – from getting close to the babies in springtime to seeing them grow up through the fall and winter seasons. *Family Admission: All members of the same household related by birth, legal status or marriage up to a maximum of seven people. Annual passes can only be purchased in person and require a photo ID from everyone 18 years of age and older. Want to give the gift of an annual pass? Visit the Edmonton Valley Zoo or any City of Edmonton Attraction to purchase a gift card. For more information please visit Gift Card Info. Edmonton Valley Zoo Annual Pass members receive unlimited admission during regular public hours for a year from the date of purchase. Get Closer: Animal Talks, and use of the zoo's Miniature Train and the Carousel rides. 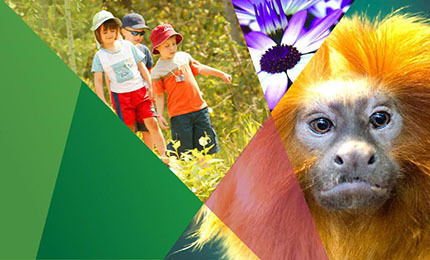 Free or discounted admission at participating zoos across Canada and the United States (with a valid Edmonton Valley Zoo expiry date sticker on the back of your membership card). A 10% discount in the Zootique gift shop. The Zootique is run by the Valley Zoo Development Society, which is a registered charity with a mandate to raise funds and awareness for the Edmonton Valley Zoo. All purchases at the Zootique support building our zoo! Discount does not apply to original artwork.